After completing the school year here in Lausanne, the kids were eager to spend some time back in Canada attending camp and visiting with friends and relatives over the summer. We were happy to oblige them and take advantage of the freedom to try some new activities in Lausanne and do some traveling on our own. With both kids shipped off to Canadian relatives in the first week of July, we made the most of being childless for the month of July. It had been at least a couple of years since we’d had the opportunity to travel together without having to worry about keeping our teenaged children engaged, entertained, watered and fed. We were really looking forward to traveling as footloose adults again! 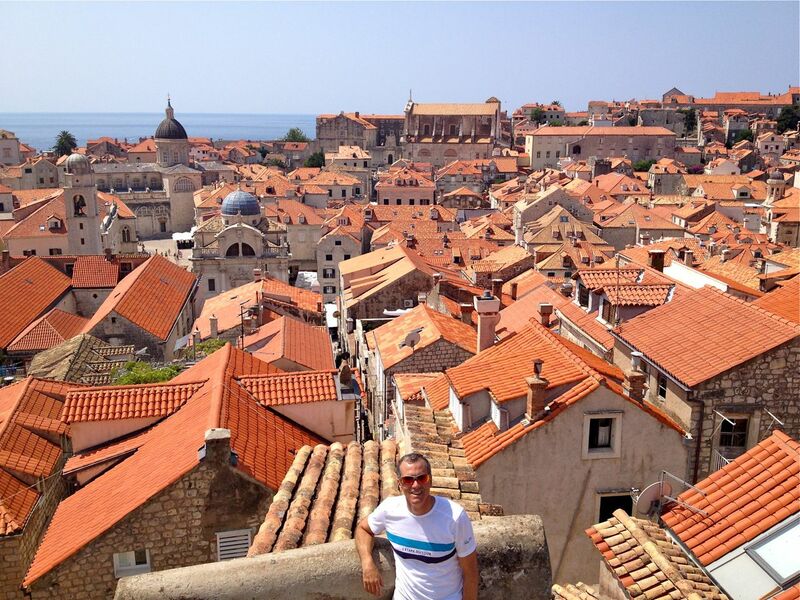 Panoramic of Dubrovnik’s historic old town, from atop the protective city walls. One of our most memorable trips of the month was a 3-day get-away to Dubrovnik, in Croatia, a beautifully preserved walled city (pop. 42,000) on the coast of the Adriatic Sea. We had heard great things about Dubrovnik from other visitors in the last couple of years, so, after confirming that there was an EasyJet flight from Geneva, we made a booking! Dubrovnik is becoming increasingly well-known as a travel destination, famous for its walled city, sandy beaches, and ruggedly beautiful coastline. The city was designated a UNESCO World Heritage Site in 1979. With origins dating back to the 7th century AD, Dubrovnik spent much of its history as an independent city-state, also known as the Republic of Ragusa. Over the centuries, a series of hostile raids and natural disasters, including earthquake and fire, encouraged the development of the city’s impressive fortifications. Dominion over the city was exchanged several times in the 19th century between the French, British and Austro-Hungarian Empires. 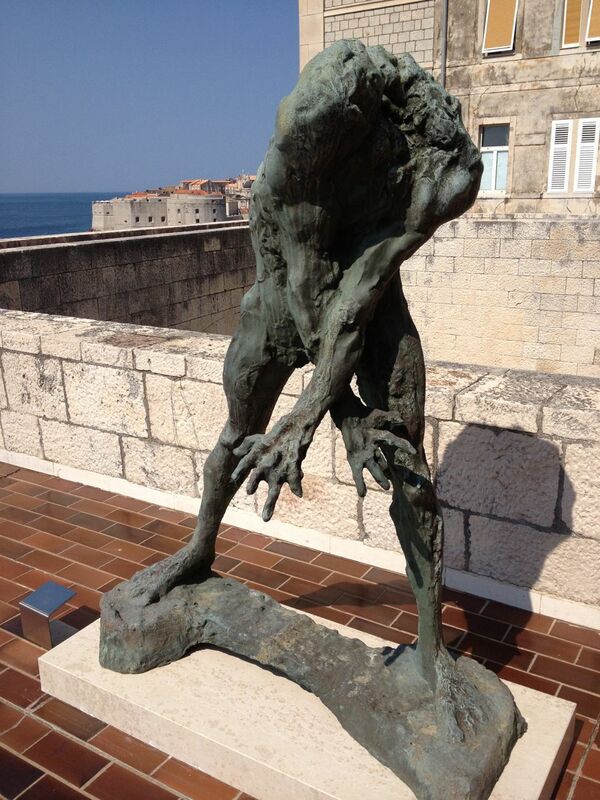 After WWII, Dubrovnik fell under the rule of Tito’s Communist Yugoslavia. After the dissolution of the Soviet Union and the fall of the Berlin wall, the Yugoslav Republic began to break apart, beginning with Croatia’s declaration of independence in 1991. In an attempt to suppress Croatia’s bid for independence, the Yugoslav army began a 7 month siege of the city, launching thousands of mortar and missile rounds into the city from the surrounding hills. Croatian forces eventually drove back the siege in May of 1992, but not before hundreds of citizens were killed or wounded and almost 60 per cent of the city’s historic core was damaged. Since that time, the city has gradually been restored to its former glory. Today the city is a thriving and increasingly popular tourist destination with few visible signs of the violence of its recent past. 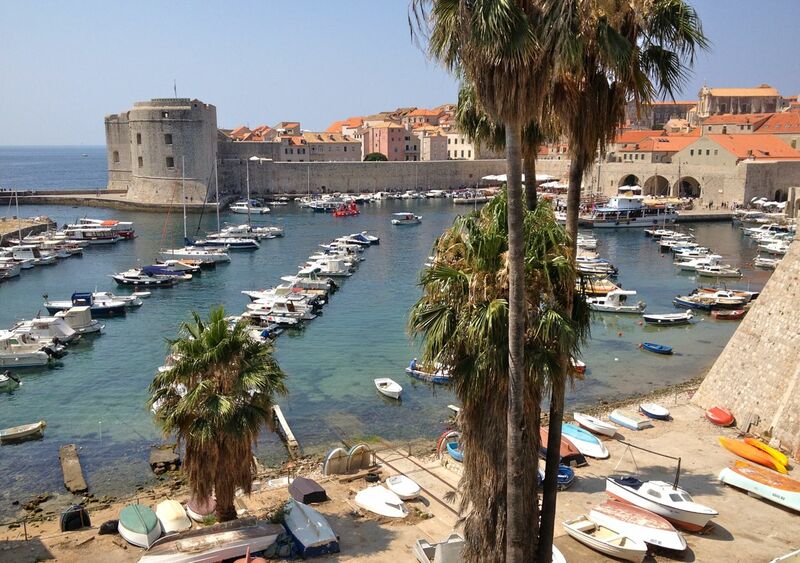 Our 90 minute morning flight from Geneva landed us in Dubrovnik by lunchtime on a Saturday in mid-July. After settling into our room at the Grand Villa Argentina, which is located on a quiet strip along the water just 10 minutes from the old town, we set off to explore. 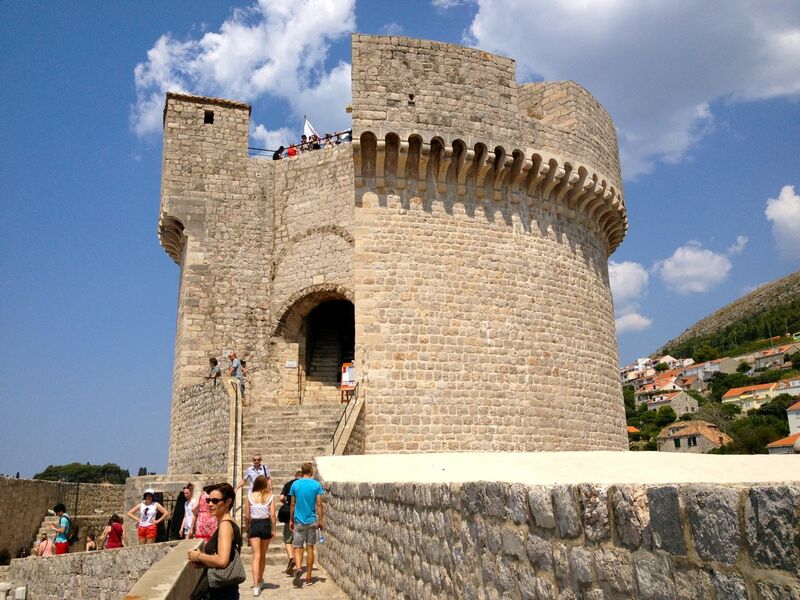 A few minutes walk brought us to a bridge leading to Ploce Gate, complete with iron grate and guards in medieval dress, which gives access to the old walled city. From the bridge one also gets a great view of the city’s harbour and imposing eastern walls. Dubrovnik city walls and harbour, as seen from the Ploce Gate. From here we descended down into the old town on narrow stone walkways with sheer 40ft walls on both sides. 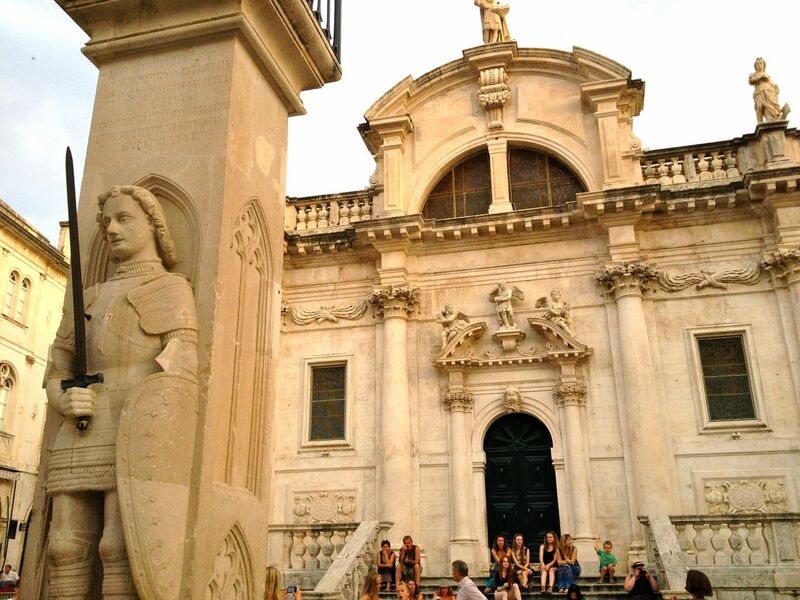 A short walk brought us out onto Luza Square, which forms the eastern terminus of “the Stradun,” a broad pedestrian-only walkway whose gleaming, polished stone cuts a broad swath down the centre of the city. From the bustling, cafe-lined square we took in views of the attractive 15th century clock tower, the ornate 18th century Church of St. Blaise (patron saint of the city), and the curious Orlando’s Column, a small statue of a knight who, according to legend, once saved the city from marauding pirates. From here we enjoyed a stroll down the bustling Stradun, lined with shops and cafes, and explored a half dozen narrow streets branching off in either direction. 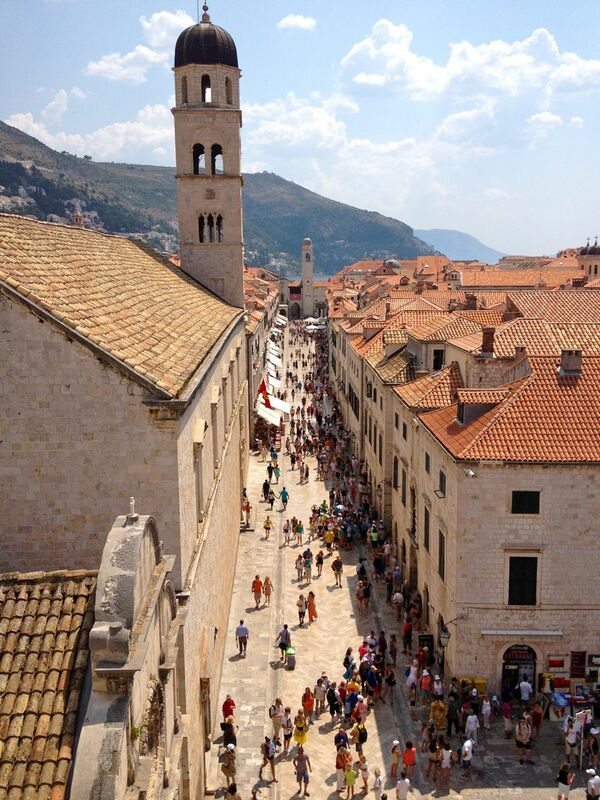 The Stradun, Dubrovnik’s main pedestrian thoroughfare. Note the polished stone. The ornate 18th century Church of St Blaise, with Orlando’s Column in the left foreground. 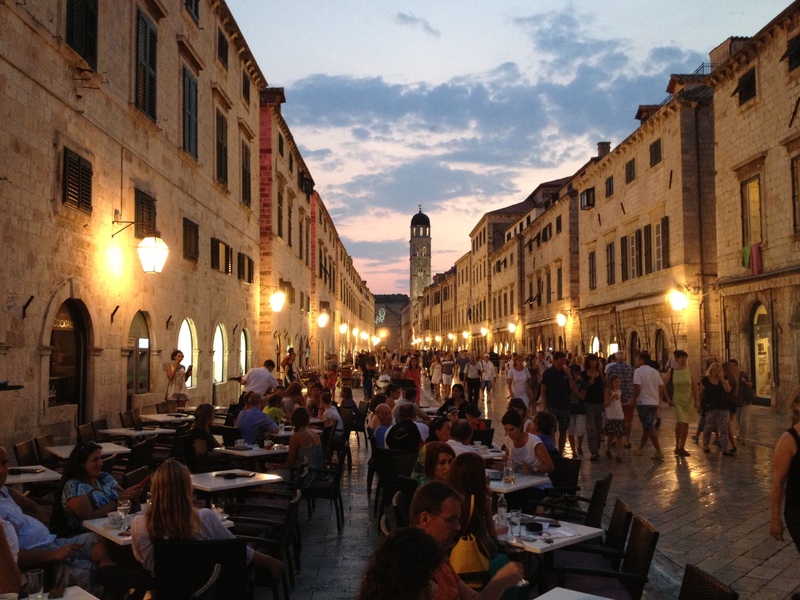 Luza Square boasts a busy cafe culture, with the 15th century clock tower rising behind. After this brief initial foray into town we returned to the hotel for a rest and a swim. Perched on cliffs overlooking the sea, the Villa Argentina property features a series of steep terraces and stairs leading down to a pool and a rocky outcrop where we sunbathed and dove into the cool waters of the Adriatic. Later that evening we strolled back into town and enjoyed a great meal at Defne, dining al fresco at this lovely rooftop restaurant that is attached to the Pucic Palace hotel. Waterfront living at the Villa Argentina. The following morning we set out again with the intention of walking the perimetre of the old town along the top of the city walls. On the way to Ploce Gate, however, a splash of colour from a banner caught our eyes and we were drawn into the Dubrovnik Museum of Modern and Contemporary Art. 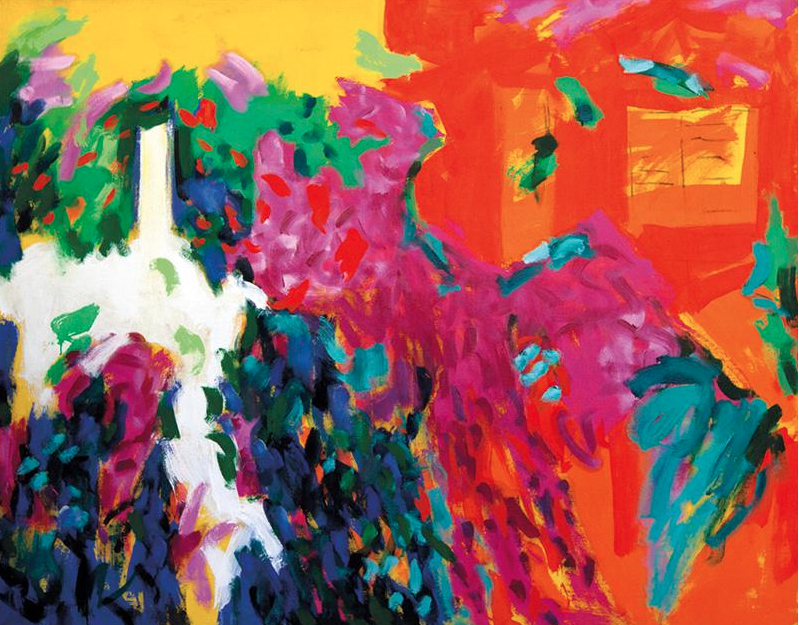 The museum was featuring a retrospective of the work of a local painter, Josip Trostmann. It was the vibrant colour of Trostmann’s recent work, much of it inspired by the colourful flower boxes and tiny gardens decorating the city, that had caught our eyes. We had the entire gallery to ourselves, and especially enjoyed the 2nd floor sculpture garden, with its magnificent views of the city walls and eastern harbour. 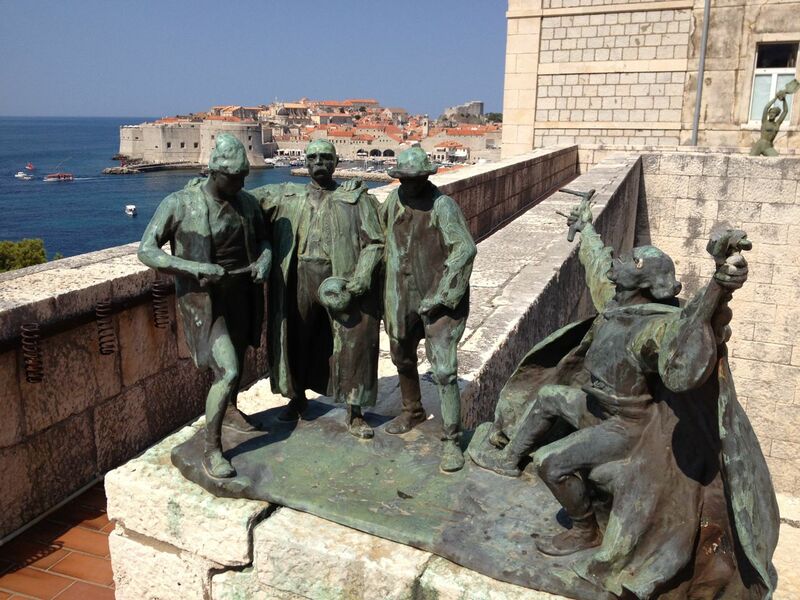 Mihanovic’s sculpture “Brotherhood” (1917), with Dubrovnik’s old town behind. After leaving the museum we walked down to the old town and made our way to one of the stairways used to access the top of the city walls. Walking the perimetre of the old town along the top of the Walls of Dubrovnik is one of the highlights of any visit here. Up to 40ft thick and nearly two kilometres in length, the walls surround almost the entire old town, rising to a height of up to 80ft. From all along the narrow stone pathways on top one is treated to stunning views of the rooftops and architecture of the old city, as well as the coastline and nearby Lokrum island. It is from this vantage point, as well, that we saw the extent of the damage done during the 1991-92 siege of Dubrovnik. Across the rooftops of the city one could see evidence of the shelling, with patches of bright, newly installed terra cotta ceramic roofing tile standing out against the duller, aging tiles that had escaped the shelling. With numerous stops along the way to admire the views and take pictures, it took us close to 2 hours to make the round trip. The rugged Dalmatian coastline from atop the walls of Dubrovnik. After descending from the city walls we made two other worthwhile stops before calling it a day. The first visit was to War Photo Limited, one of the few galleries in the world dedicated to displaying war photography. War Photo Ltd displays both permanent and temporary collections of photographic images from the Yugoslav and other conflicts, in order to educate visitors about the horrors of war. The gallery has an extensive collection of photos from the Croatian war of independence, including images of a rubble-strewn and fire-ravaged Dubrovnik. Standing in the midst of such a beautiful city today, it was difficult to fathom the brutality, horror and devastation witnessed here barely 20 years ago, and to think how fragile such places can be. 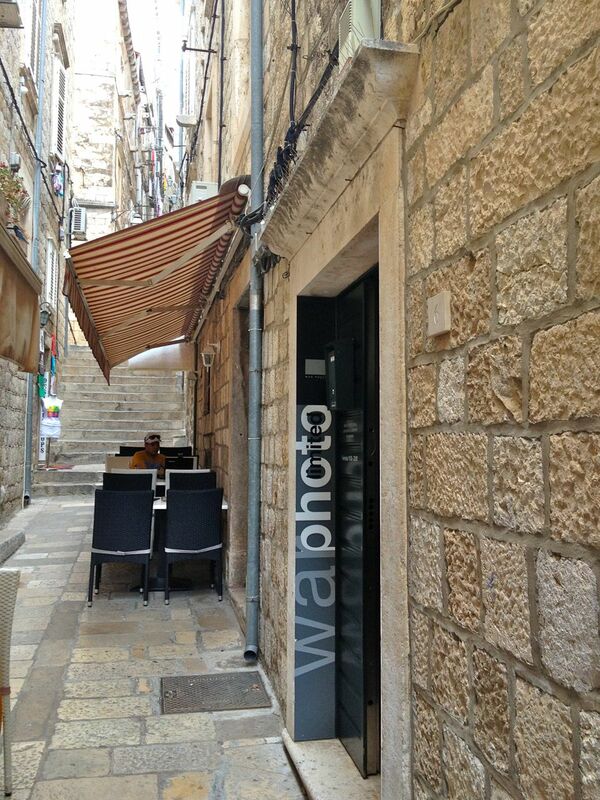 The modest entrance to the War Photo gallery, along a narrow alley off of the Stradun. 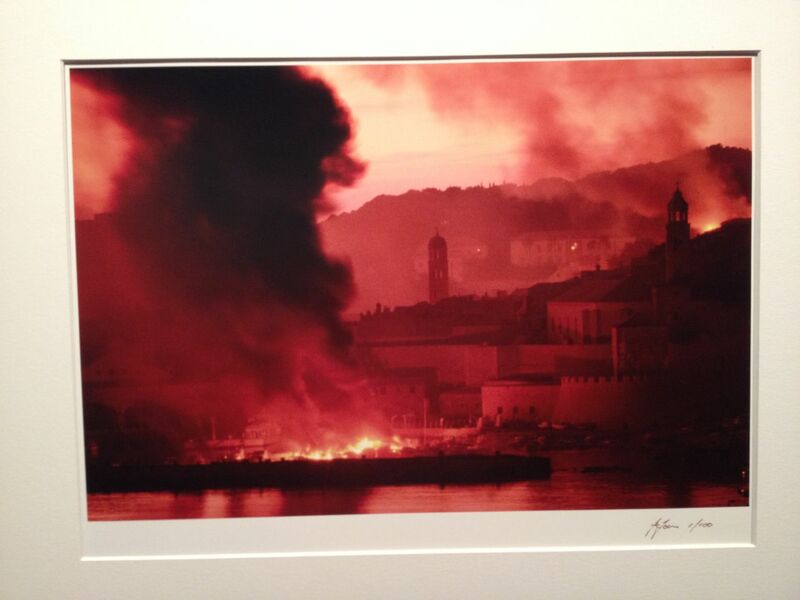 A chilling photo of Dubrovnik ablaze during the siege of 1991-92. 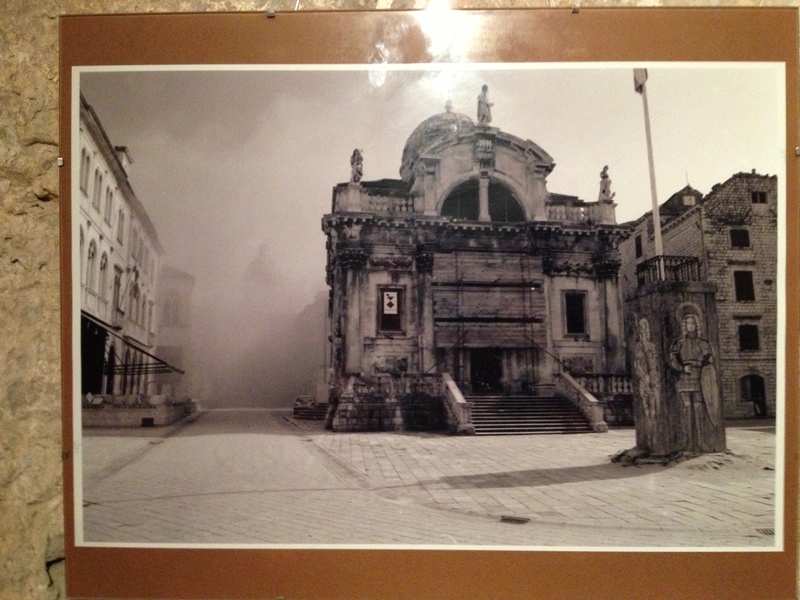 The Church of St Blaise in Luza Square, during the 1991 siege of Dubrovnik. Our second stop was at the cloisters of the 14th century Franciscan Monastery located at the western end of the Stradun. 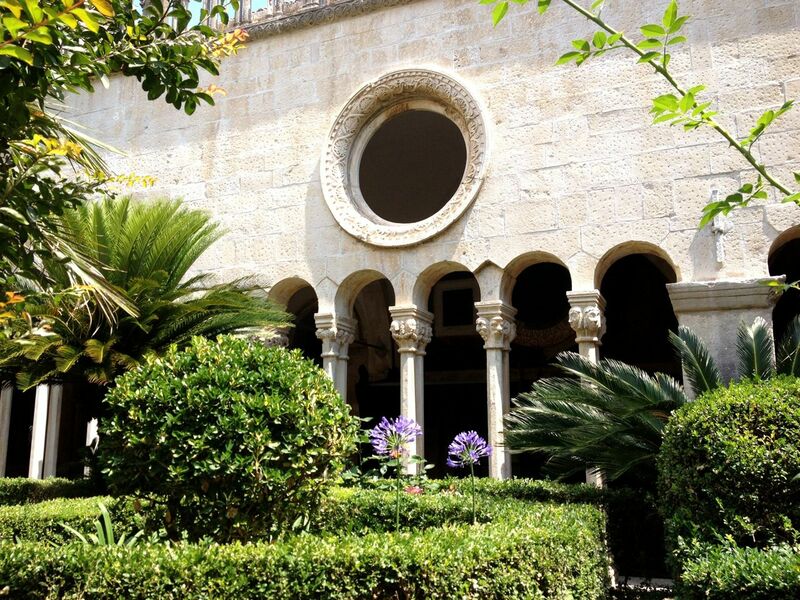 In addition to the lush inner courtyard garden, the monastery houses a working apothecary, and an interesting and macabre collection of artifacts, including a preserved foot once belonging to St Blaise. 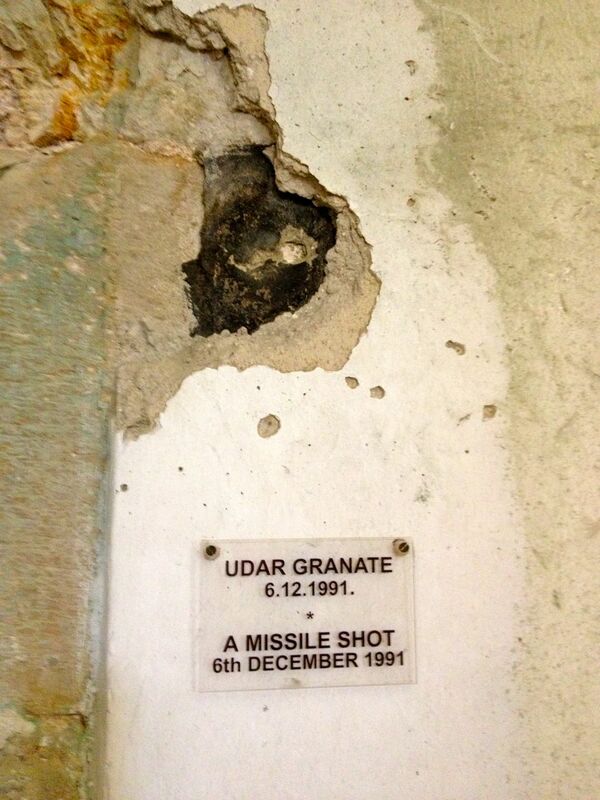 The monastery, which has since been restored, was shelled dozens of times during the 1991 siege, and a number of holes in the walls from missile hits have been preserved as reminders. Cloister and gardens of the Franciscan monastery. Shell damage from the 1991 siege. Following an afternoon of touring the old town we retreated back to the hotel to sunbathe and doze by the Adriatic for a while, cooling off periodically with a plunge into its salty waters. 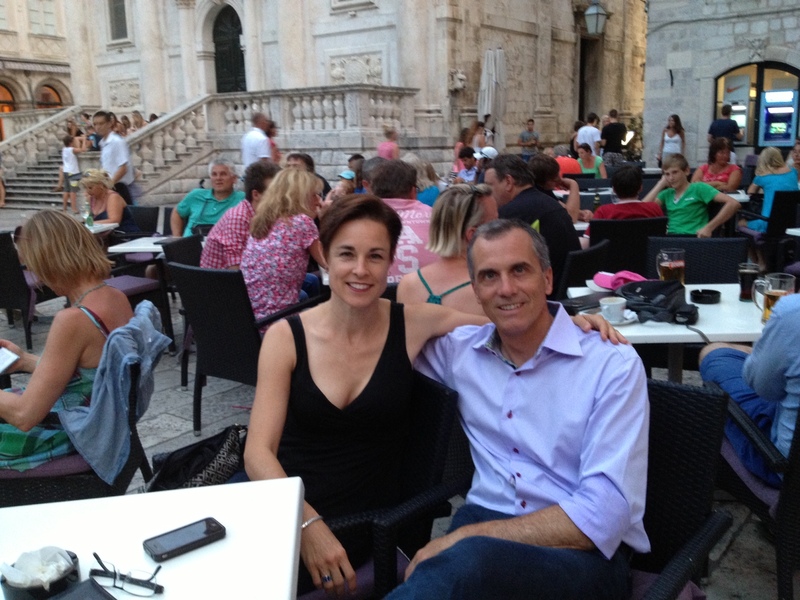 For our last evening in Dubrovnik we chose to dine at the Victoria Restaurant, which is attached to the hotel, and is known for having one of the best views of the old town anyhere in the city. Here we enjoyed some incredible food and sampled delicious Croatian wines made from indigenous grape varieties, such as the Plavac mali grape, that one seldom hears of in the rest of Europe, let alone North America. A bottle of Ivan Dolac Barrique (2007) was particularly memorable. 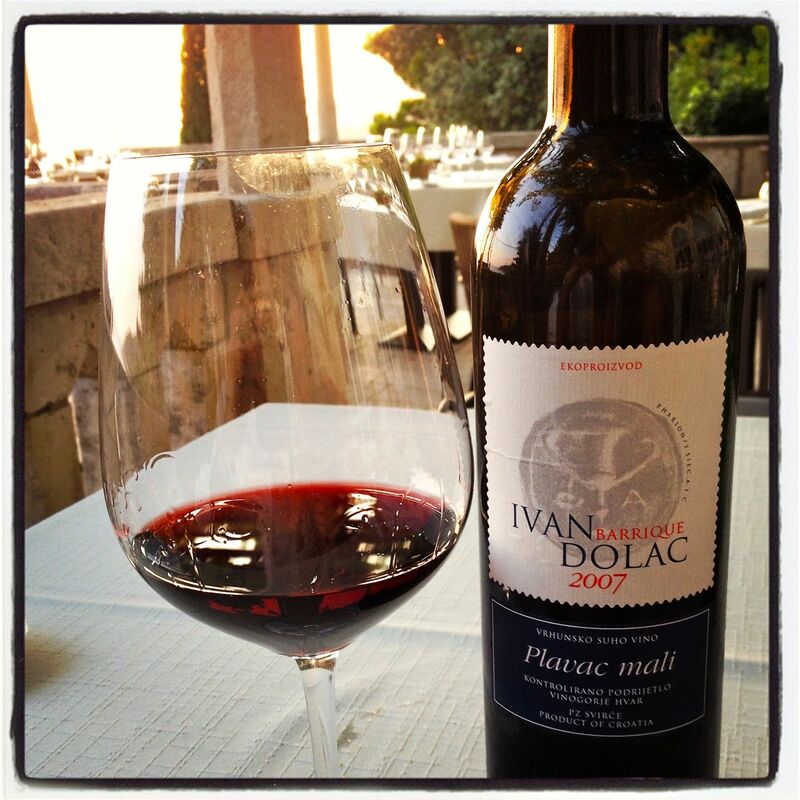 If you are lucky enough to find Croatian red wine with labels bearing names like Ivan Dolac, Dignac, Plavac mali, or Postup in your local wineshop (or LCBO for Ontario friends), I highly recommend them! 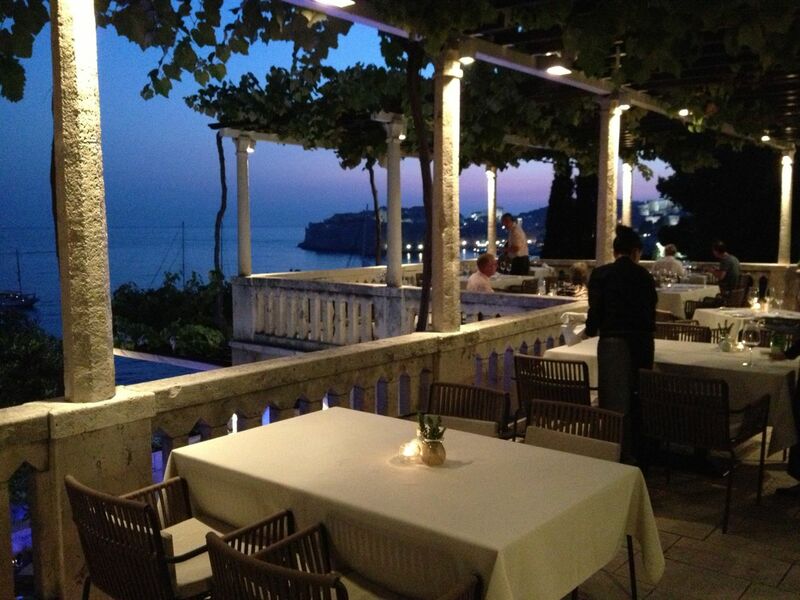 The Victoria Restaurant overlooks the Adriatic, with Dubrovnik’s old town in the distance. The 2007 Ivan Dolac Barrique was delicious! 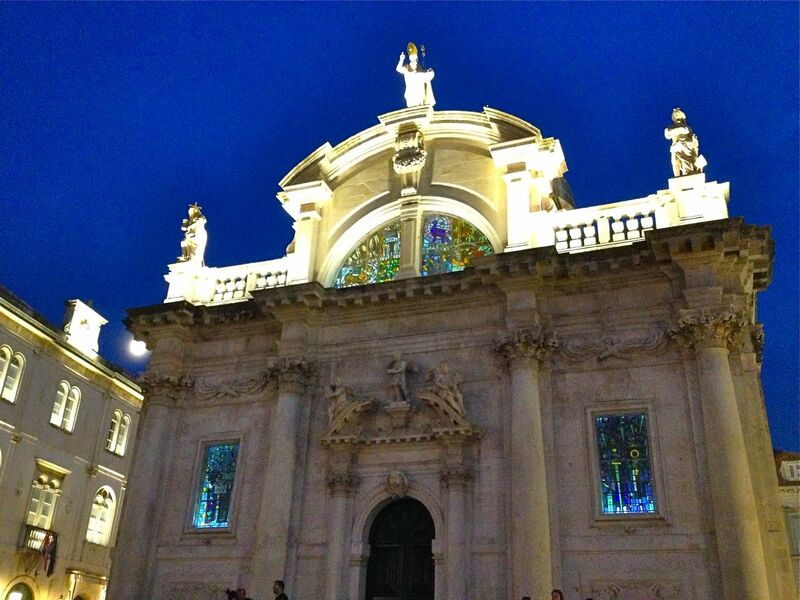 To wrap up our weekend in Dubrovnik we took an after-dinner stroll back down into town to enjoy Luza Square and the Stradun by night. The old town takes on a whole different appearance at night, with the streets, squares and buildings illuminated by warm lamplight. Evening light on the Stradun. Enjoying aperos in Luza Square. The Church of St Blaise, whose gorgeous stained glass becomes apparent at night. For the finale to the evening we headed to a piano recital by Gergely Boganyi. Croatians, like Europeans in general, are still huge fans of classical music and they flock to the thousands of concerts, recitals and festivals held in towns and cities throughout the summer, many of them outdoors. Tonight was no exception and we joined the line of eager classical music enthusiasts making their way to the recital. 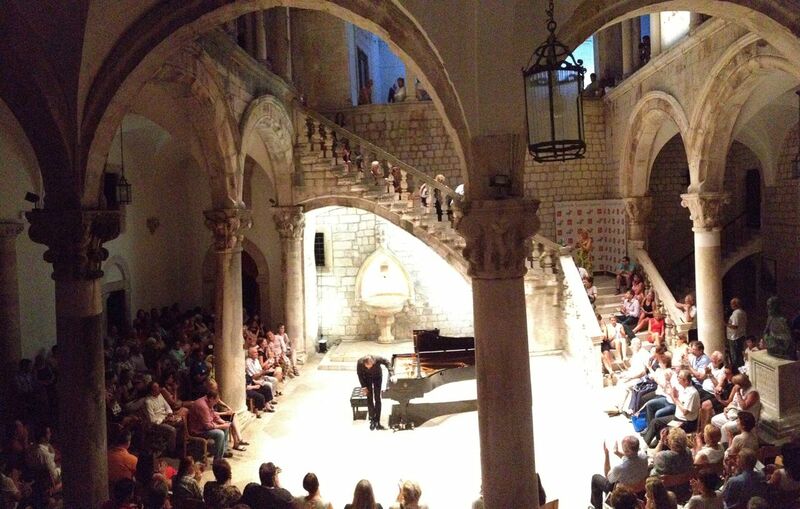 Pianist Gergely Boganyi accepts the applause of the audience at the Rector’s Palace. The Hungarian-born Boganyi specializes in playing the works of Chopin and Liszt (not that I know anything about either composer), and he once performed Chopin’s entire piano repertoire non-stop over the course of 2 days. The recital took place in the atrium of the 15th century Rector’s Palace, with an audience of about 150. I have not listened to or followed classical music much in the last couple of decades, but I have to admit that I was spellbound by Boganyi’s technical virtuosity (or so it appeared to me), as well as his passionate interpretations of Chopin and Liszt. The ambiance of the palace setting helped too, no doubt. You can get a taste of the concert towards the end of the short highlight video below. 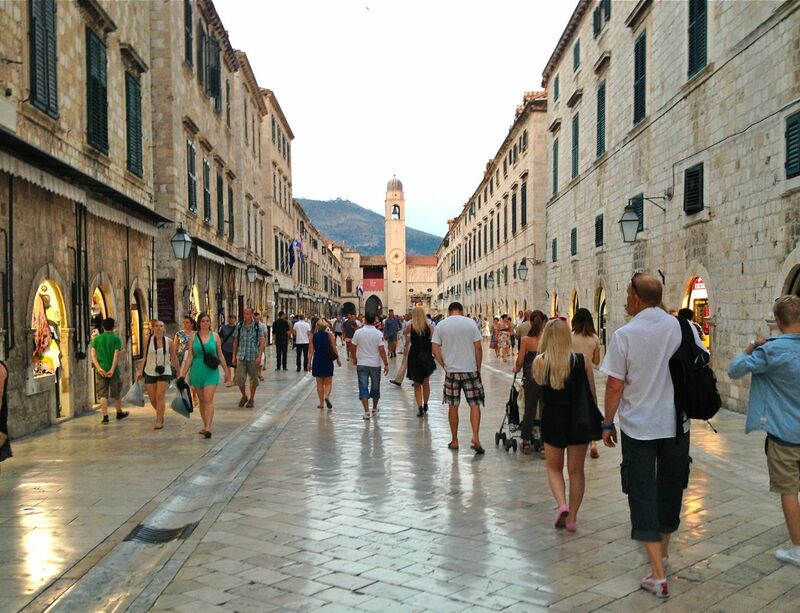 Overall our impression of Dubrovnic was of an incredibly beautiful, culturally interesting, and easily walkable small city with great food and friendly, welcoming people. Two to three days is plenty of time to take in the city sights. More time would be needed to explore the islands and other sights along the Dalmatian coast, which we hope to do on a return trip one day. We were also struck by how clean the city was compared to other similar destinations, such as Florence and Venice, which can get a bit grimey with the hordes of summer tourists. Here you could literally eat off the polished stonework of the Stradun. And the weather was Adriatic perfection, with sunshine and 30C temperatures every day, but with a steady coastal breeze keeping things comfortable, even in the old town. 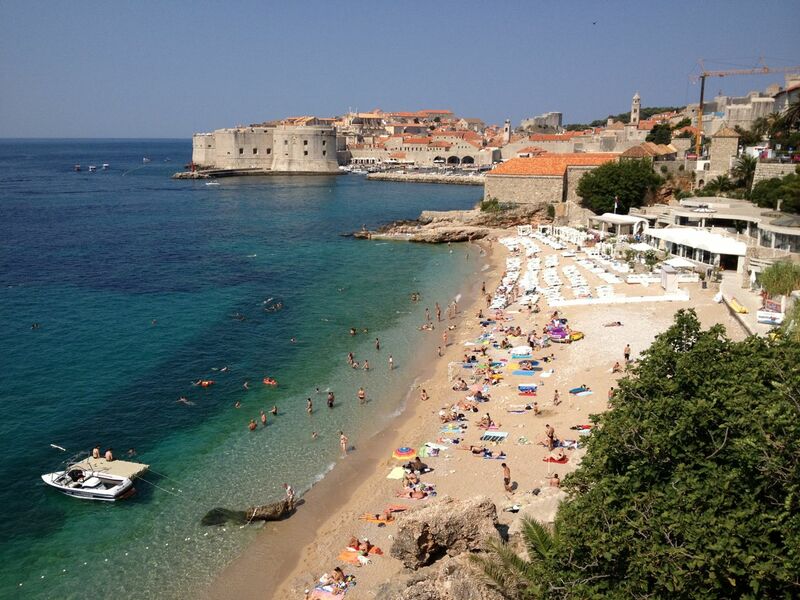 If I were you, I would make sure to put Dubrovnik on your bucket-list. ← Allez Emma! Allez les Vaudoise!